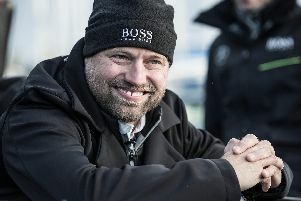 Hugo Boss skipper Thomson is currently leading the 3,000-mile transatlantic race as part of his build-up to the 2020 Vendee Globe. The Gosport-based sailor will be making his fifth attempt at the prestigious ocean race having finished second in 2017, but emphasised the roles of Mills and Knox-Johnston in his career. Following a 70-day trip to Greenland together, Clipper Ventures boss Knox-Johnston made Thomson a skipper on one of his boats aged just 25. Thomson, now 44, then became the youngest skipper to ever win the race in the 1998-99 edition. Thomson said: 'At the time I was young and didn't really think about it too much, but you think about it now, he let a 25-year-old skipper a race around the world with amateur crew. 'The next person on my boat was six years older than me. He took a real risk, I didn't consider it at the time but he took a massive risk and he has been a massive influence and massive support ever since. 'He is going to be 80 in March and to me he is the same bloke he was then, he has just sailed back from Greenland this year. One of Thomson's crew aboard the Clipper boat was Air Miles and Nectar Card founder Mills, who would encourage Thomson to pursue his Vendee Globe dream. 'I said I don't know, I've just started a business and it is going well. 'I mean, who does that? 'I went to see him a couple of months later in London and he said: “I think we have been doing this wrong way Alex, I don't think we should rent a boat I think we should buy a boat”. ‘I'm not joking, a week later we flew to Brest in a little prop plane and he bought a boat for £1.1m Euros. 'I had to scrape my chin off the floor and put it back in the plane, what do you say to a man who does that? 'He has always been there for us, and not just as chairman of our company now. He doesn't tell us what to do, it is just a bit of advice. 'The night before the first Vendee he said: ‘I need you to know, if you don't want to do this, if you want to pull out now, that is totally cool with me”. 'Four years later he pulled me aside and he said: “Alex, I just need to let you know something”. Now, having failed to finish his first two attempts at the Vendee Globe in 2005 and 2009, before a third-place finish in 2013 and a second in 2017 with a damaged boat, Thomson is determined to go one better again. He added: 'It should have happened last time. It is difficult not to see what happened last time as a missed opportunity really. 'But next time we have to go there better, stronger, with a faster boat, a more reliable boat, a more prepared skipper and all the rest.